Western pond turtle peeking out. 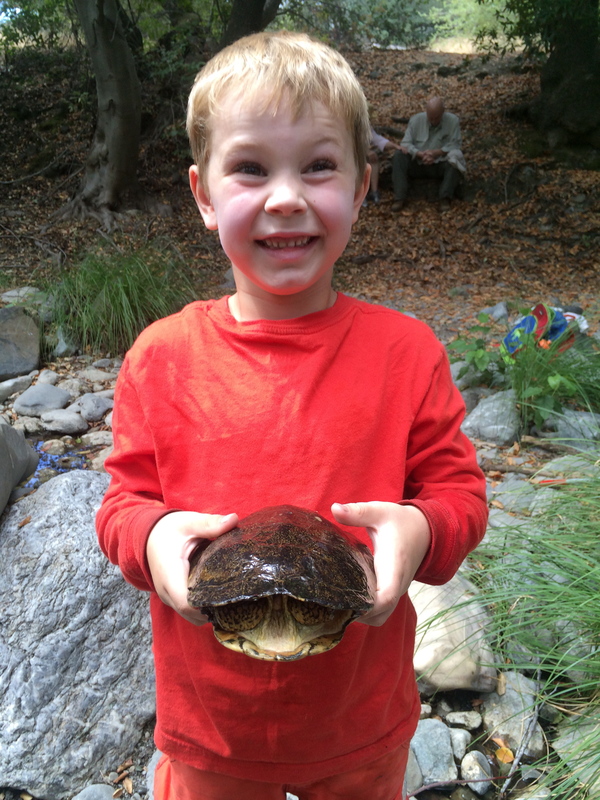 Kieran releasing western pond turtle. 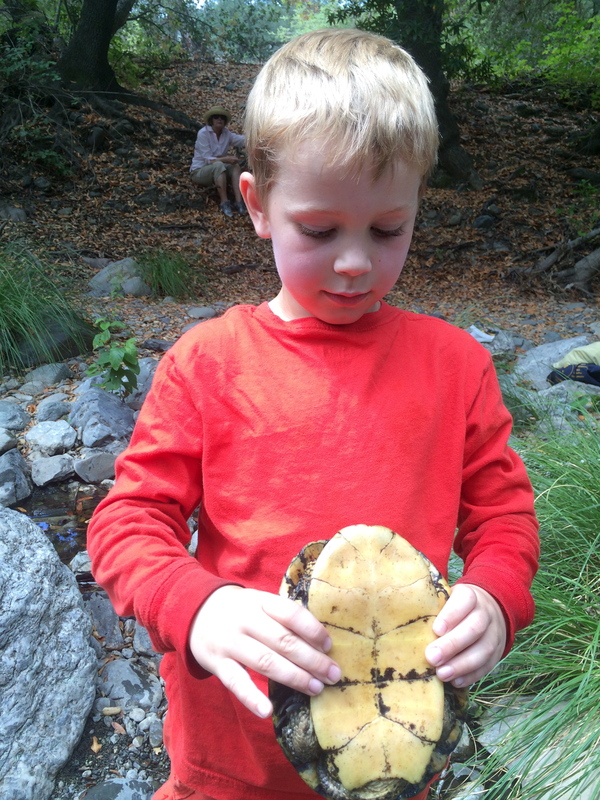 Today Kieran I took his grandparents to Sunol Regional Wilderness, one of our favorite places to hunt for crayfish. As soon as we got out of the car we felt the weight of the hot summer sun on our shoulders. Kieran led us across the high bridge over Alameda Creek, which is big enough to even have running water during this drought, and down the dusty trail through the grassland and forest along the stream. We admired the big, bent oaks and the enormous California sycamores with their curious, peeling bark. Within five minutes we met two rattlesnakes! 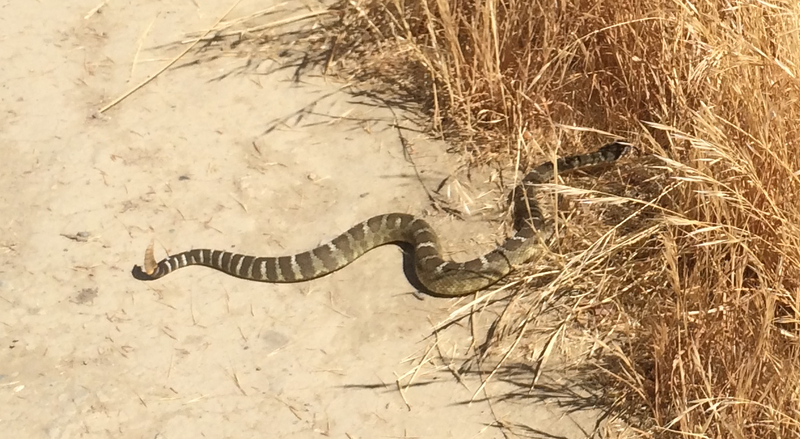 The first was pretty small, about three feet long, curled in the grass right at the edge of the trail, buzzing noisily. It wanted to cross the trail. We watched it zip across and disappear into the grass. One rattlesnake is pretty amazing, but two is almost unbelievable. 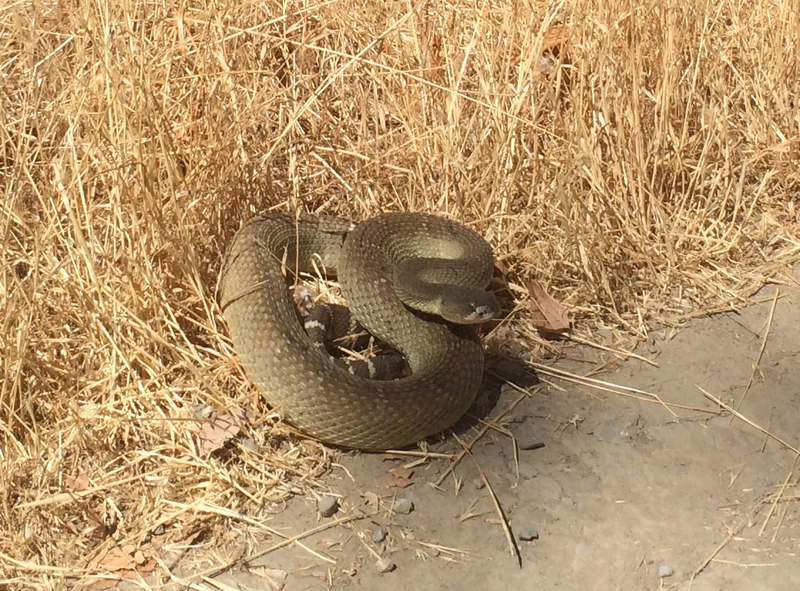 But just 50 yards down the dusty trail we met another Crotalus oreganus, also a lovely slate green like the other, but this one bigger, maybe four feet long, coiled up and quite lively in the hot sun. After a careful detour around the second rattlesnake, we crept down to the creek where everything was cool in the dappled crepuscule beneath the trees. 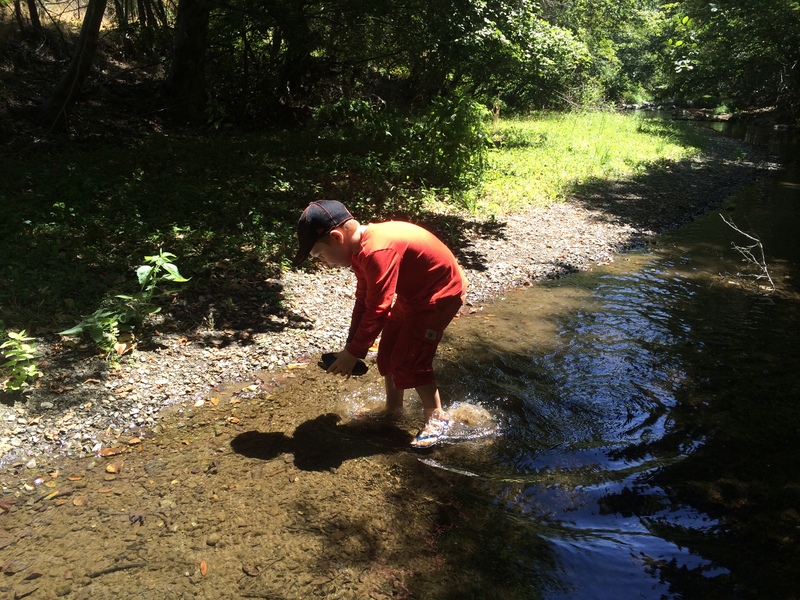 While his grandparents rested on the bank, Kieran waded into the stream, catching many water striders (Genus Gerris) and also a fierce predatory true bug called a “toe biter.” We also captured a small crayfish, and put it into a bowl of water to watch it swim around and around. The find of the day, though, was a large, healthy Western pond turtle (Actinemys marmorata), California’s only native turtle species. The Western pond turtle is under pressure from several species of introduced turtles like the red-eared slider and painted turtle, the kinds people buy in pet stores and then release into the wild later. So we were thrilled to find this one! He wouldn’t come out of his shell at first, though we patiently waited. He was on “turtle time” and not in any hurry. Eventually we found that by immersing him in water we could get him to emerge and “swim” while we held onto him. 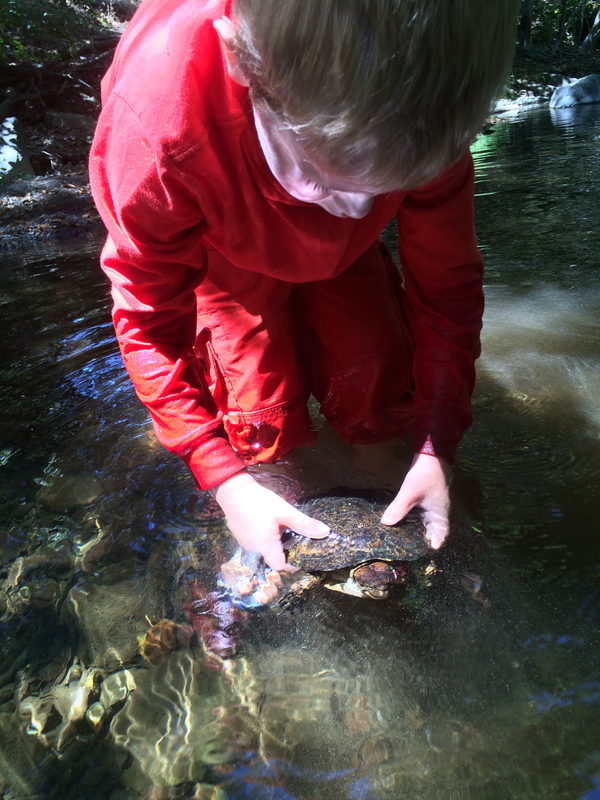 At last, my son released him back into the placid stream and he swam off very nimbly.